Multiplexing systems typically interface to high speed fiber optic and microwave transport systems. They are responsible for converting the very high speed digital transport pulses into individual analog and digital circuits used by system end devices. For example, a SONET OC-3 (Optical Carrier level 3) transport facility running at 155.52 Mbps will support slightly over 2000 analog equivalent telephone circuits. Synchronous Optical NETwork (SONET) transport systems include an integrated digital cross-connect function. These cross-connect systems are responsible for the integrating, routing and monitoring of mid-level digital circuits such as DS-3, T-1 and Ethernet between operating nodes. SONET systems are synchronous systems operating at very high speeds thus requiring a high precision timing source. 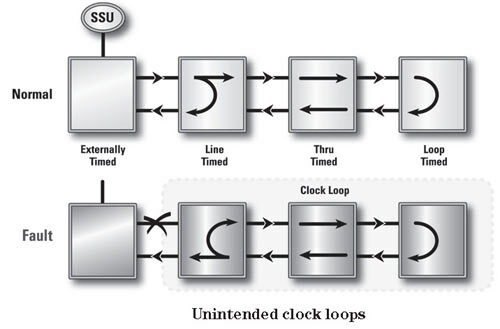 A typical external timing source is either referenced to (via GPS Satellite) or is an actual atomic clock timing reference. Such sources are widely available and easily deployed as needed. These precision timing sources can also be used in several other applications in utility operations and substation environments, such as Sequence-of-Events and Fault Recorders. DACS systems are typically deployed where there is a requirement to groom (route) the individual 24 time slots in a T-1 circuit. These systems, where required, are located downstream from mid-level transport circuits and a channel bank device. A channel bank is required when it is necessary to convert (de-multiplex) time slots in a T-1 circuit to individual digital and analog circuits used by end devices. It is not uncommon for a channel bank function to be integrated with a DACS function in a single device. The telecommunications world is fast migrating to a switched packet transport mechanism. While Ethernet will transport virtually any protocol, the mostly widely used protocol today is TCP/IP. Where rigorous error checking and delivery redundancy is not a requirement, the simple and fast UDP protocol is often used. Ethernet devices typically interface to a SONET multiplexer at the DS-1 or DS-3 level. SONET multiplexer plug-ins allow for the direct interface to standard 100 Mbps fast Ethernet devices but are often not efficient in the use of the OC-x transport structure. In metropolitan areas, common carriers often use very high speed Ethernet for circuit transport without the benefit of SONET. In these cases, the Ethernet transport system includes an overhead management function not unlike the SONET management functions. Contact Utility Telecom Consulting Group to discuss your telecom needs today. You may also fill out our inquiry form and we'll get back to you immediately. Copyright ® 2007 Utility Telecom Consulting Group, Inc.